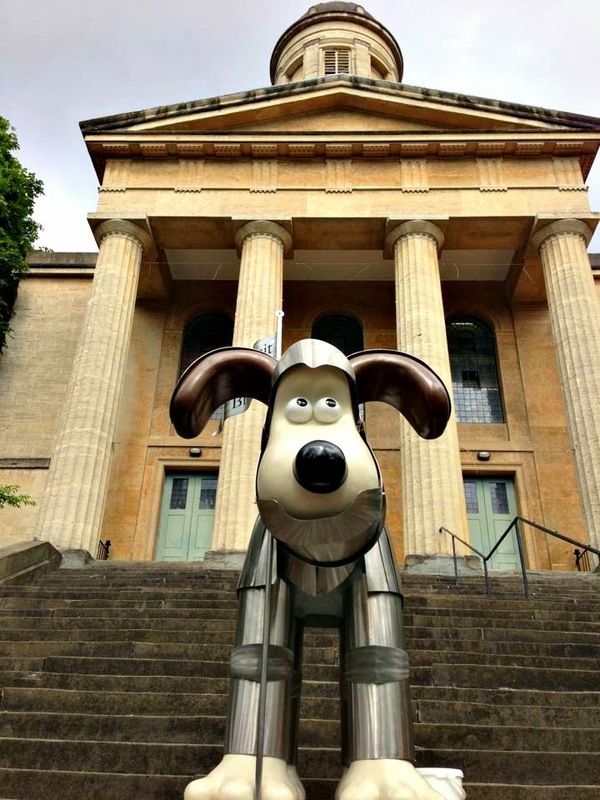 Sir Gromit of Bristol; your knight in shining armour! I managed to get along to The Greatest Dog Show on Earth this morning--queued for less than an hour, result!--so I thought I'd best get a shuffle on with my round-up posts so that I can bring you my favourite parts of the exhibition later on in the week. Can you say epic pic-spam? Brace yourselves! Two cracking Gromits in this first batch. I loved It's Kracken, Gromit for its superb punning and the fantastic design. We discovered it on a rather sunny day, so the picture isn't all it could be. It's very dramatic and a little bit Lovecraft. 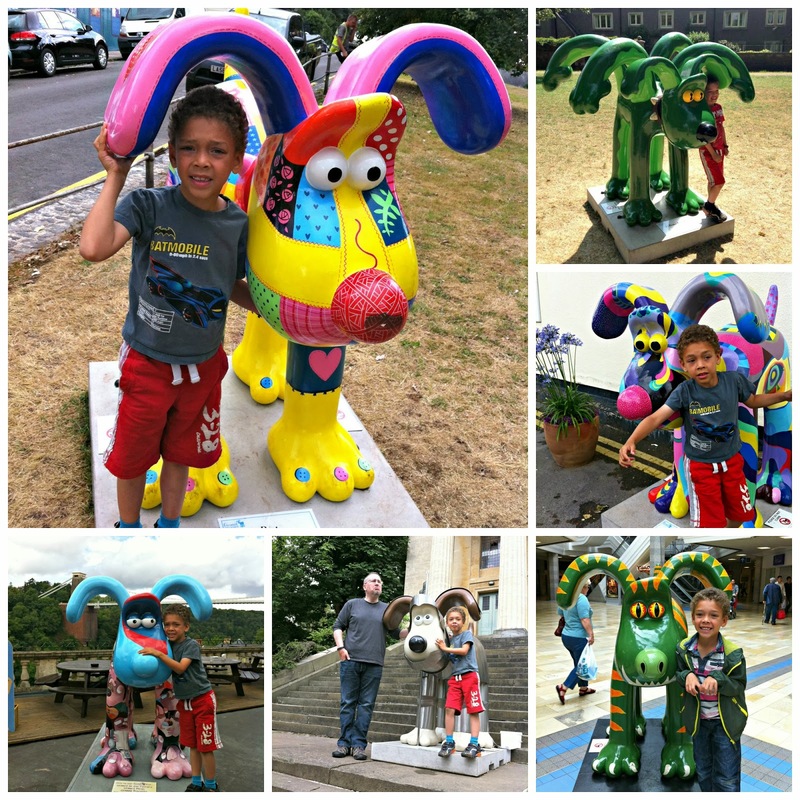 Shipshape and Bristol Fashion was a fantastic 'Bristol Gromit', celebrating lots of our famous landmarks and areas. He also had a splendid backdrop of Brunel's Suspension Bridge. Here are the three train station Gromits. Luckily for us, Dave had to go up to London for work while the trail was running, so he claimed Classic Gromit for us when he was passing through Paddington Station. We popped into Temple Meads Station one afternoon after we'd been at a Doctor Who convention in Yeovilton--I really need to get around to writing that up--and saw Isambark Kingdog Brunel and just inside the station, May Contain Nuts and Bolts. Both fantastic Gromits, and much hugged by Lucas. I'm not a cat person, but I really liked Simon Tofield's Doodles Gromit. I might have to check out his Simon's Cat books. 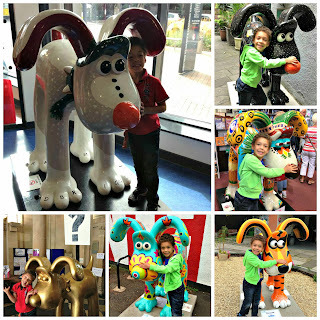 Talking of books, I grew up reading the Beano comic book, and it was really fun to see Dennis the Menace and Gnasher decoupaged all over Gnashional Gromit! 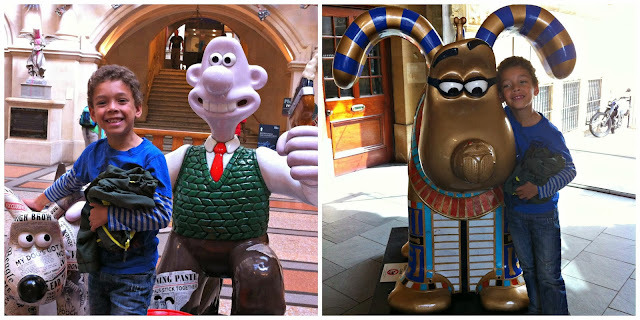 I wrote about our adventures at the City Museum a little while ago when we claimed Newshound and Tutan Gromit I. 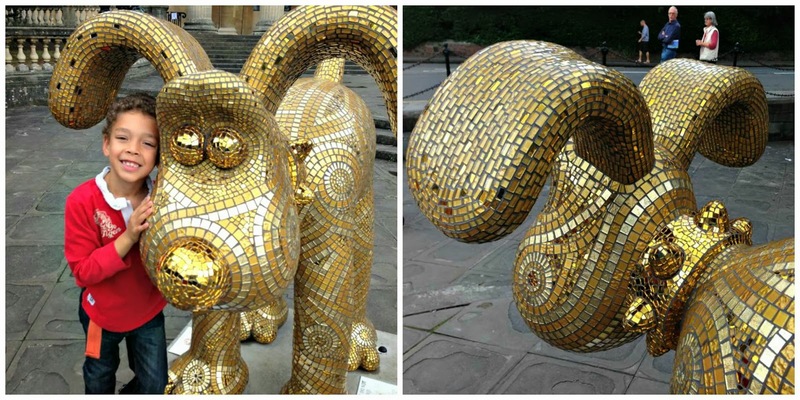 This Gromit is absolutely stunning! There's a fascinating 'making of' video that you can watch to see how he was created. I love how it turned into a family affair. Bumble Boogie was a really fun Gromit. There was a big red button in front, which Lucas made a beeline for...Being a veteran of many disaster movies I know that one should never press a big red button! Just as I was about to scream, "Nooooo!" jazz music started blaring. It turned out that Bumble Boogie was designed by Jools Holland and was accompanied by music by him. Bushed was a real disappointment. 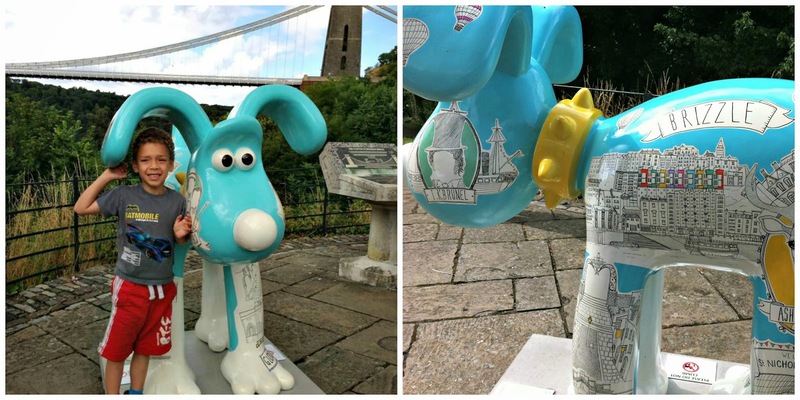 It seemed like a really low-effort Gromit design, and I didn't feel any warmer towards it after viewing it again today at the exhibition. We found Carosello and What a Wind Up with some of Lucas's friends from school. 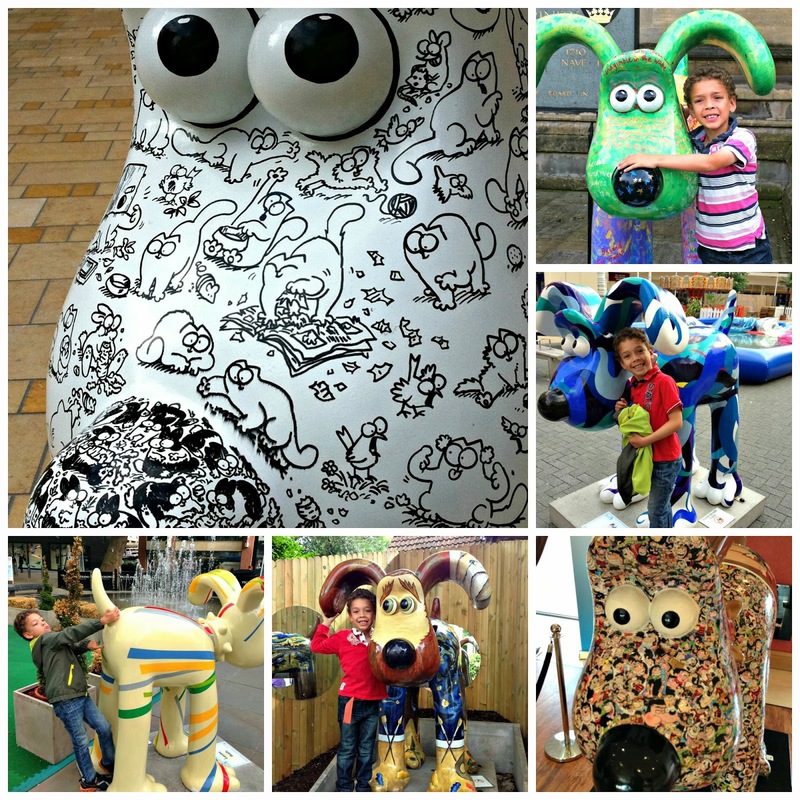 We spent a fantastic Friday morning rambling around Bristol with loads of kids in tow, having masses of fun! 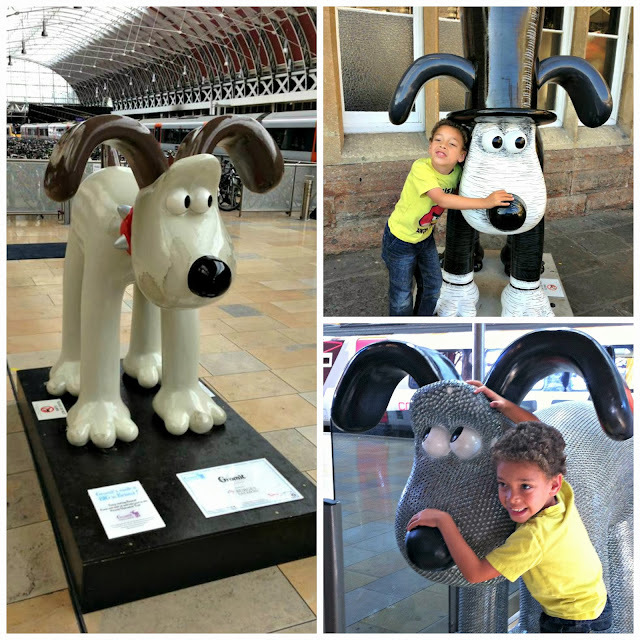 Sheepdog was quite clever; if you look closely you can see Shaun the Sheep driving Gromit. 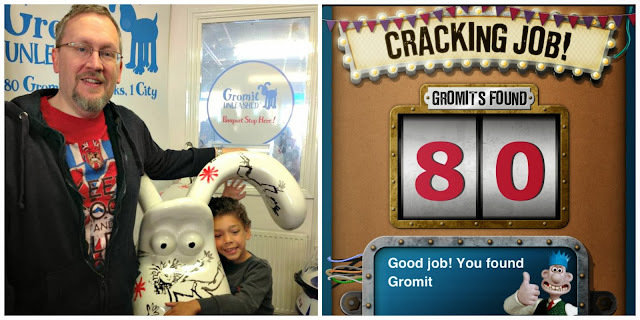 Lucas was super-excited to see Grrrromit, who was decorated like his tiger-striped Trunki. He did look pretty fierce! We all thought that Why, Dog, Why? was a bit of a disappointment. I expected something more witty than a gold-painted dog with a question mark sign. Luckily Nezahualcoyotl, I refused to even attempt pronouncing that one, was much more interesting. He's a funky Aztec-inspired Gromit and was a lot of fun to visit. ...and we're done! 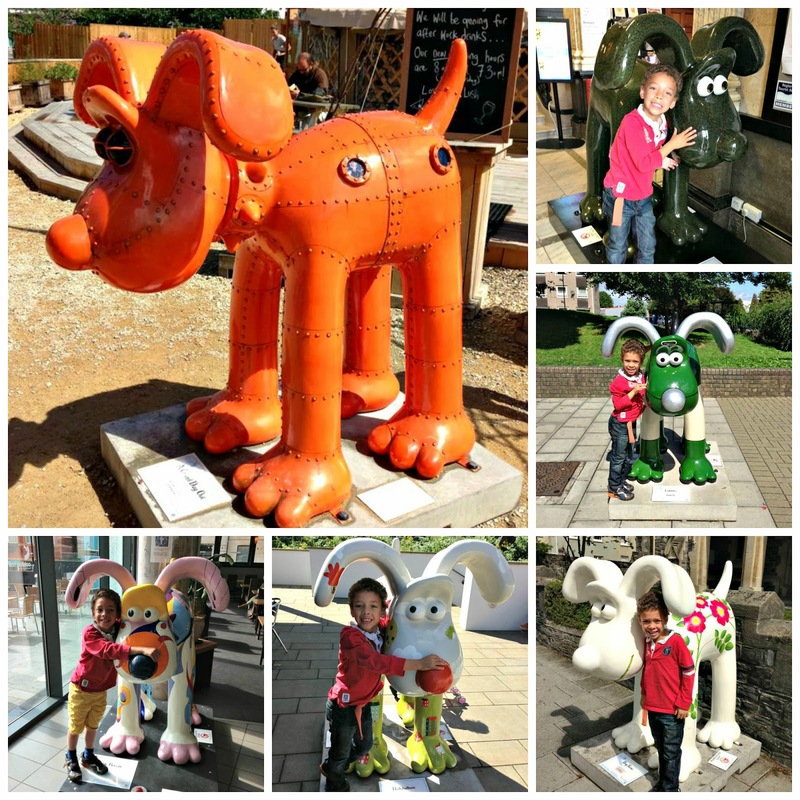 What a cracking summer thanks to Gromit Unleashed! 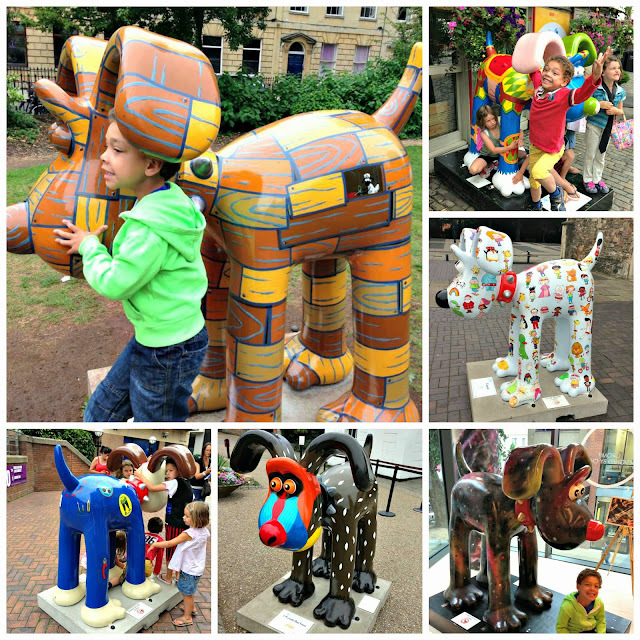 I loved It's Kraken Gromit and Isambark Kingdog Brunel; they were my faves I think (although there were so many fab ones, it's difficult to choose!). Yep! I got in at long last. Still thrilled about it!